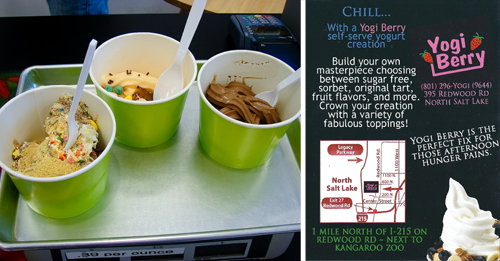 Today I want to share my favorite yogurt shop in Salt Lake! My kids attend school in North Salt Lake. So for the past year I have been driving by Yogi Berry's 2 times a day, EVERY day. About a month ago I finally stopped by with the kids. I am in love! Yogi Berry's is brillant! Instead of charging you an arm and a leg and your first born child to get more than one topping (which if your anything like me choosing just one topping is torture, but it's not worth paying for two!) you get unlimited of whatever you want! You start by picking your cup size, picking your yogurt flavor(s) and then going to town on your toppings! All on your own, everything is self serve. Then you get your bowl weighed and you pay by the ounce! I LOVE it. Each of my kids makes completely different creations (one doesn't do toppings), and after paying for 5 yogurts I still had cash to spare! Also I use the punch card and every 10th yogurt is free! 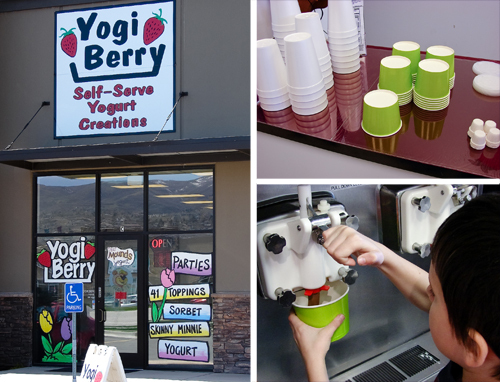 Yogi Berry's has 6 different flavors of yogurt at all time. They ALWAYS have chocolate and Vanilla but the other 4 flavors change ever few weeks. I have LOVED the coconut, mint, pina colada and pistachio! The kids have loved the strawberry banana, mango, and of course chocolate. They have over 30 topping options at all times. 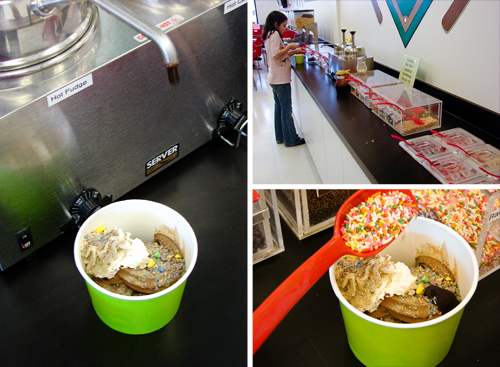 The kids loved the gummy bears and sprinkles while I went for the Reese's pieces, crushed candy bars and hot fudge. I think my kids like the pint size tables, chalkboard wall and cartoons even better than the yogurt sometimes. It's a very family friendly place and we go at least once a week now! The kids think I'm the best mom ever for spoiling them and I love how totally affordable it is!